As well as serving the public, Cornwall to Chester, London to Lanarkshire, Lazy Susan has expanded our business to supply a large number of trade customers throughout the UK. We've handpicked a few examples below to help you to see who we have supplied recently. Hampton Court Palace - Our tables and chairs are used on site for functions and in-house catering. Hampton Court Palace purchased a number of four seater round sets in white, to use at wedding functions. Upwaltham Farm Barns - Our furniture is used at the stunning Upwaltham Farm wedding and party venue for al fresco seating at functions. 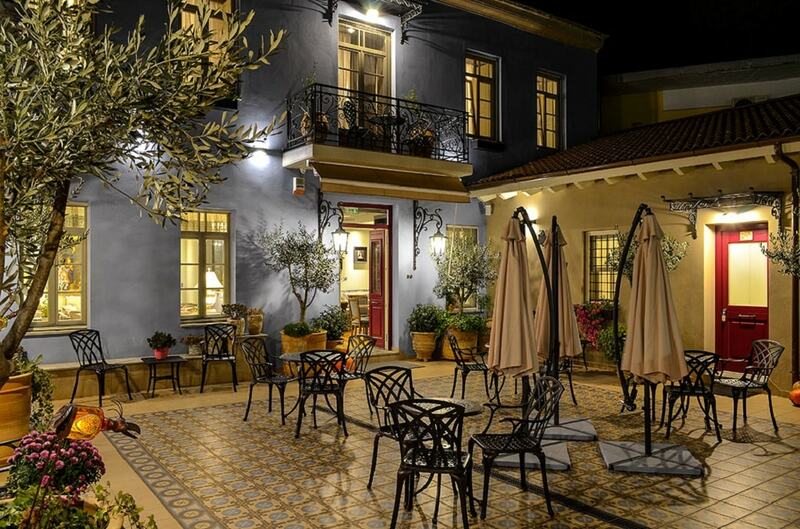 The stylish design of our furniture works beautifully in the picturesque setting. Low maintenance and eye-catching in form, it can be left outside when not in use and simply wiped down before functions. Made from aluminium, it is lightweight and easy to move around. Pedham Place Golf Centre - This popular and recently refurbished 18 hole course in Swanley, Kent is home to over ten of our 4 seater round 120cm dining sets. 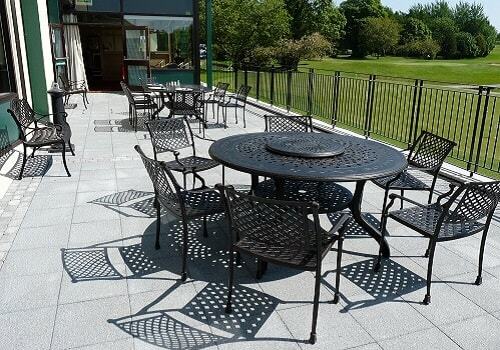 Saffron Walden Golf Club - Home to one of the finest parkland golf courses in East Anglia, Saffron Walden Golf Club has a number of our round 6 seater outdoor dining sets on their terrace overlooking the 18th green. We extended an offer to the club members for a discount on their own sets and have supplied a number of Club Members. Wimbledon Tennis Club - A number of our sets can be found on site at Wimbledon Tennis Club. The maintenance free, weather proof nature of the furniture means that they can be kept court side all year round, if necessary. Chester Zoo- Our furniture can be found amongst the animals on site in the grounds of Chester Zoo. Well not exactly amongst the animals, but adjacent to a historic building. Chester Zoo purchased half a dozen sets with seating for upwards of 40. Pleasurewood Hills Country Park - The popular theme park has a number of our dining sets having ordered our products for two consecutive years for their public catering area. 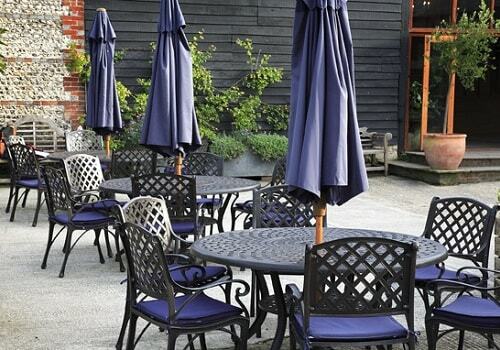 Pleasurewood Hills ordered around 25 bistro tables each with 4 Jane metal stacking chairs. The Jane and Mary chairs are particularly suitable for contract use as they are both light and very durable. 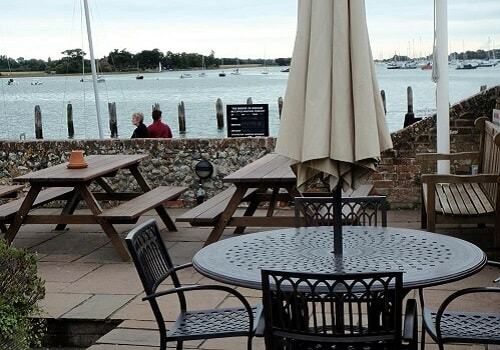 Bosham Sailing Club - Our furniture is used at Bosham Sailing Club. Being weather resistant, our seating provides the perfect seating for a quayside glass of wine after a long day out on the water. Just 3 meters from the sea, Lazy Susan aluminium garden furniture does not rust, so it is the perfect choice for coastal properties. As a result of seeing the furniture here, several club members are now boasting Lazy Susan furniture at their houses. Oldercare Care Homes - Sussex and Hampshire venues. Another care home operator, where we have supplied many large rectangular 8-10 seater Madison sets. Lazy Susan also supplied trade customers abroad!